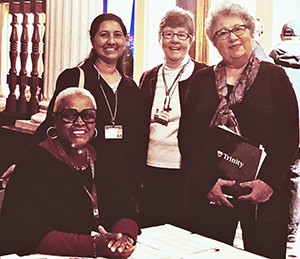 Sister Ann Howard is the Director of Campus Ministry at Trinity Washington University, a ministry she began in 2016. "Trinity’s story is one where the mission of the founding Sisters of Notre Dame de Namur holds firm and women are being admitted to Trinity today who perhaps thought that they would never achieve their academic hopes of attending college, "she said. "The students are fully engaged in their studies, in spirituality and in social justice issues. My role is to encourage volunteer service in the DC area as well as to support the students’ spiritual life on campus." Sister Ann’s journey to Trinity began in her home state of Connecticut where she was born and raised as the fourth of five children. "We were a close-knit family. We enjoyed each other’s company and that of our extended family who also lived in the area. We were involved in our local parish and had the chance to enjoy sports and other activities which my sisters and brothers and I pursued in high school and during our college years." Sister Ann attended the University of Connecticut (UCONN), where she enjoyed an active social life and graduated with a degree in sociology. She had an early interest in spirituality—a Catholic spirituality—that began in childhood. " I was always drawn to religion and theology." Ann said. "It is something which has sustained me throughout my life." 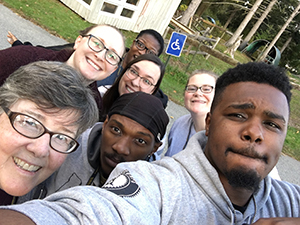 During her freshman year of college, Sister Ginny Sheehan who was serving in Sister Ann’s home parish invited her to meet the sisters in her community. They shared stories of Saint Julie Billiart and their ministries during that visit. " That planted a seed for me, “ Sister Ann said. “It offered a glimpse of a possible calling as I considered several life paths during my college years". After graduating from UCONN, Sister Ann entered the Sisters of Notre Dame de Namur. She completed her formation and served as 5th grade teacher in Springfield, Massachusetts for several years. During that period, She also served as a volunteer at Loaves and Fishes Kitchen, where she would welcome guests and respond to the many questions they posed about religion. “ I became aware of the hunger people had for spiritual things,” she said. 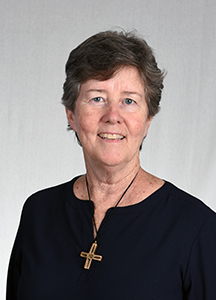 After making final vows in 1987, Sister Ann discerned with her leadership about future paths and entered a graduate program at the Weston Jesuit School of Theology in Boston, graduating with a Masters of Divinity degree. Moving to Hartford, she lived with a wonderful community on Laurel Street and served in campus ministry at East Catholic High School. This led to ministries in adult education at Trust House, and Notre Dame Mission Volunteer Site Director. Continuing her education, Sister Ann followed CPE towards certification as a chaplain in 2010. She then ministered as a pastoral associate in a parish and as a chaplain at a Catholic hospital before moving to Washington. "I often reflect on Saint Julie’s abundant love and belief in God’s Goodness and her willingness to move from France to Belgium to flesh out her belief in a religious congregation of women meant to go throughout the world,” Sister Ann said. “This is our heritage. Today, this means we nurture openness to intercultural relationships, to women’s rights, to the power of education and the sharing the Goodness of God in us across racial, language, and generational lines. God’s Goodness is with us through all of life’s circumstances. Our charism is an ageless and deep well from which we draw inspiration each day, in ministry and in prayer. "